Assam University of Science and Technology. i) Research Assistant (RA): M.Tech. (Civil / Chemical / Mechanical / Electrical / Energy Engineering / Electronics / Instrumentation, Agricultural Engineering / Allied subjects), MSc. (Physics / chemistry / related topics) with at least 60% marks in total (or equivalent CGPA). Candidates can get a chance to do research in order to complete the doctoral degree on the basis of performance and performance in research and performance under the fulfillment of the required criteria according to the norms in the university. ii) Post Doctorate Fellow (PDF): Ph.D. Regarding science and technology from any recognized university / institute. Tenure: The maximum period is 36 months, which is renewable on annual basis. 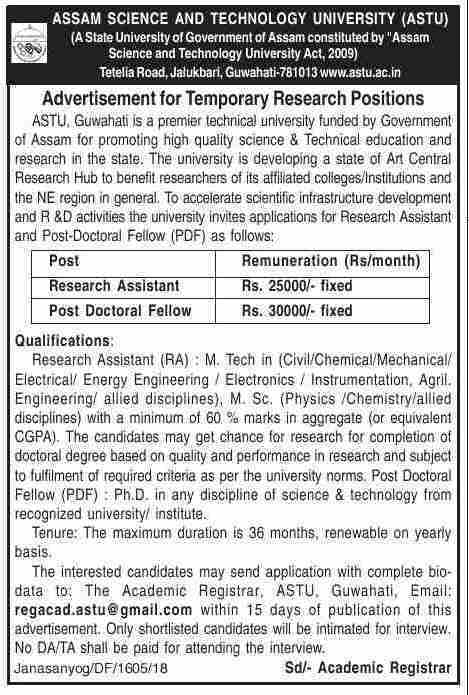 How to apply: Interested candidates can send application with complete bio data to the academic registrar, ASTU, Guwahati, email: regacad.astu@gmail.com within 15 days of publication of this advertisement [06/08/2018] Are there. Only shortlist candidates will be notified for the interview. No DA / TA will be paid for participation in the interview.